Ross Hall's love of history is reflected in what is one of the most extensive collections of vintage black and white photography in the American Northwest. 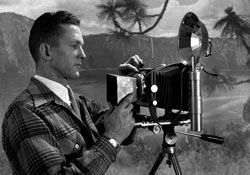 The collection has retained nearly 60,000 negatives from its total studio production of over 600,000 large format images. These have been carefully preserved by the Hallans Gallery in Sandpoint, Idaho. "The Collection" is currently available to private collectors as museum quality reproductions through the website and at the Hallans Gallery.